1 Make PowerPoint Look Good! 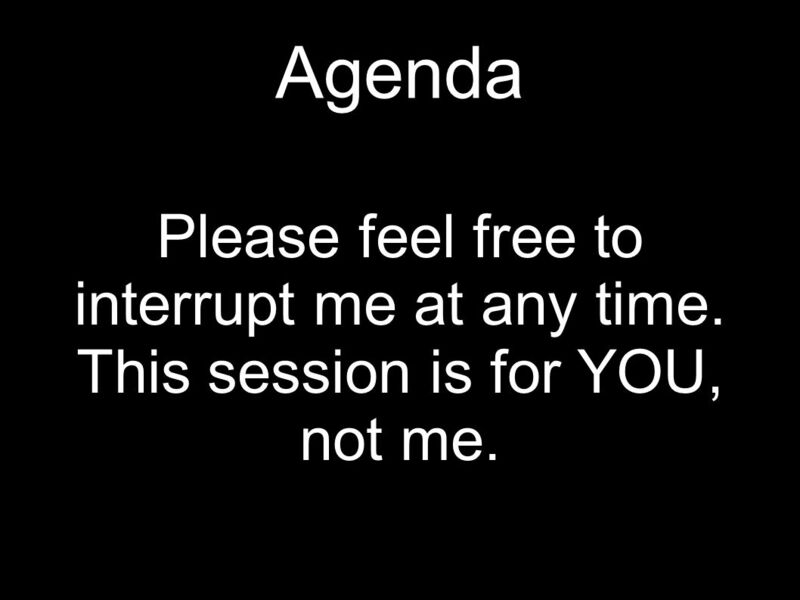 3 Agenda Please feel free to interrupt me at any time. This session is for YOU, not me. 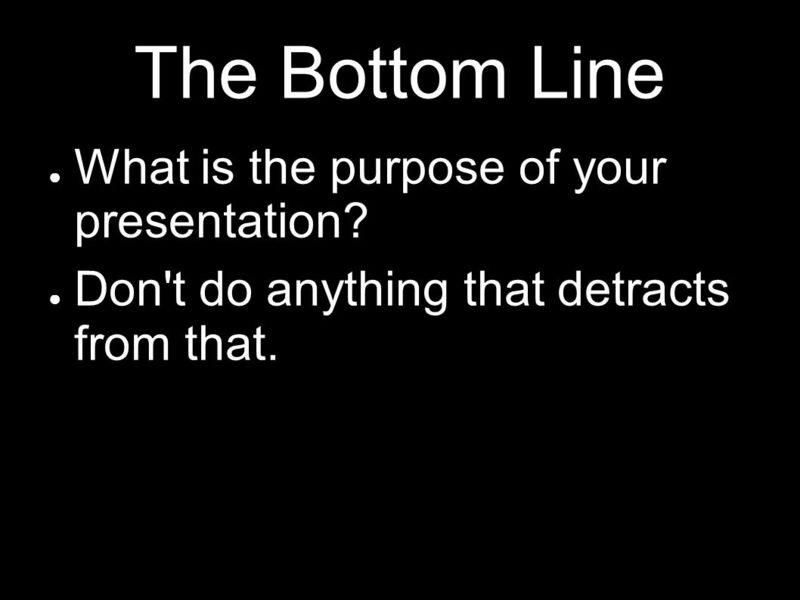 5 The Bottom Line What is the purpose of your presentation? 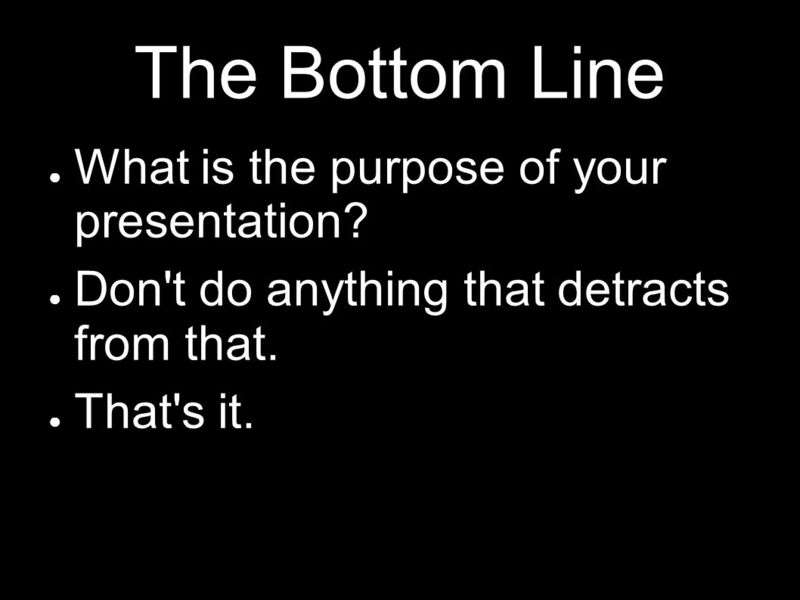 6 The Bottom Line What is the purpose of your presentation? Don't do anything that detracts from that. 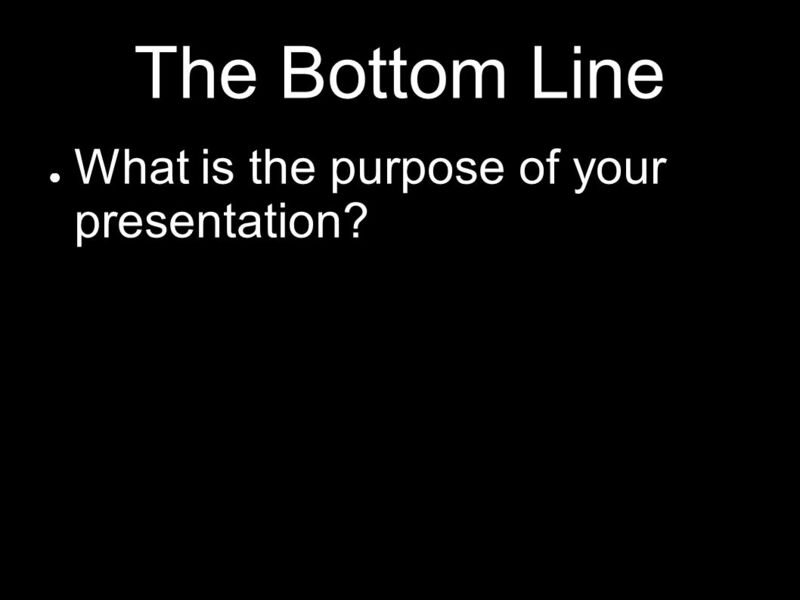 7 The Bottom Line What is the purpose of your presentation? Don't do anything that detracts from that. That's it. 8 Too Many Words! A common mistake among presenters is the assumption that a multimedia presentation can be treated the same as a report. The problem is that reports are meant to be read by one individual at a time, while most multimedia presentations are given to a larger audience while the presenter stand in front of them and talks. 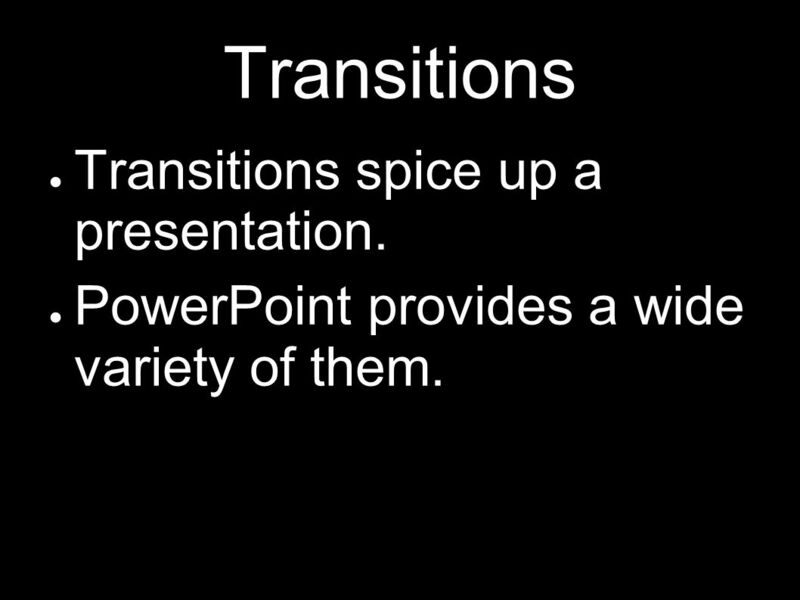 The purpose of a PowerPoint in that case should be to reinforce, rather than usurp, the role of the speaker. The audience should be looking to the presenter for information first, with only the key points or relevant visual aids being shown on the screen. 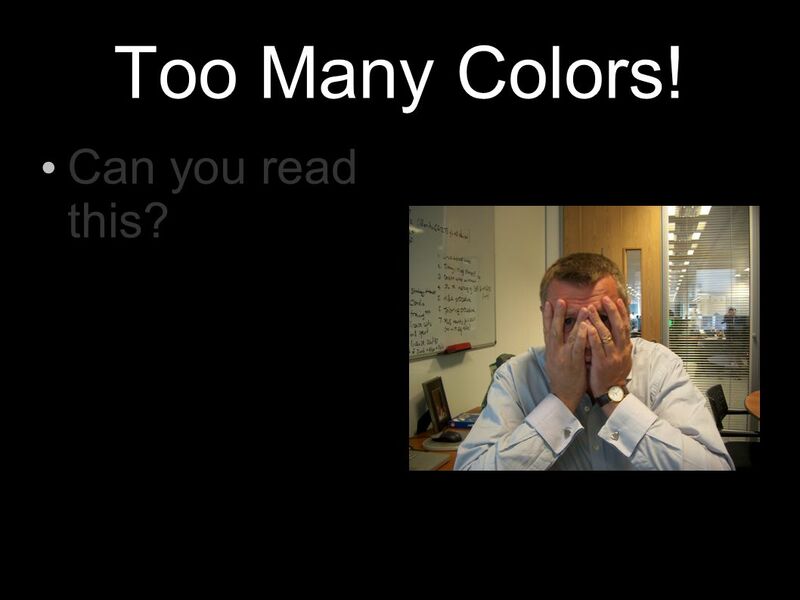 Unfortunately, PowerPoint has the nifty feature of shrinking the text to make it fit, no matter how much you write. This means amateur PowerPointers decide to write until they run out of room, but don't really run out of room. The result is something like what you see before you now – text that is too small to read for all but the front row of the audience. This can be confusing, annoying, or at best, the audience will ignore the text completely. But if the audience is ignoring your text, then why did you bother to write it in the first place? 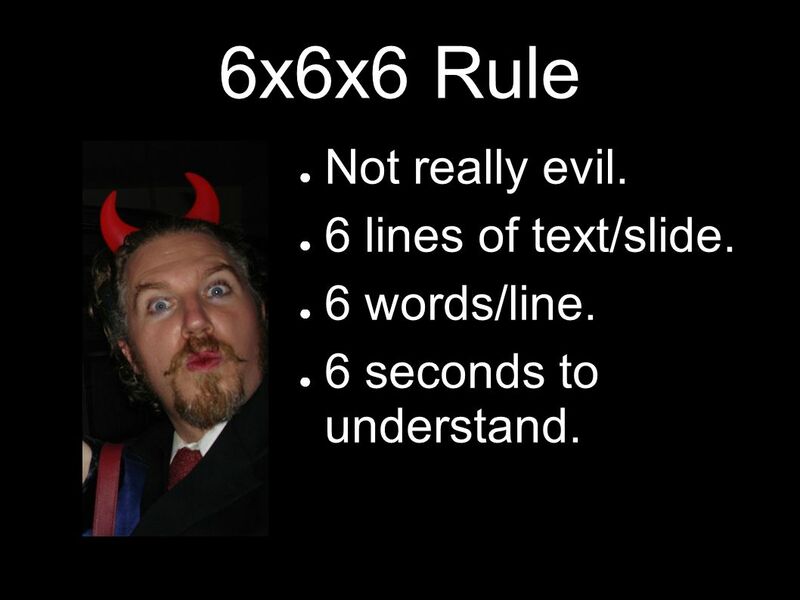 10 6x6x6 Rule Not really evil. 11 6x6x6 Rule Not really evil. 6 lines of text/slide. 12 6x6x6 Rule Not really evil. 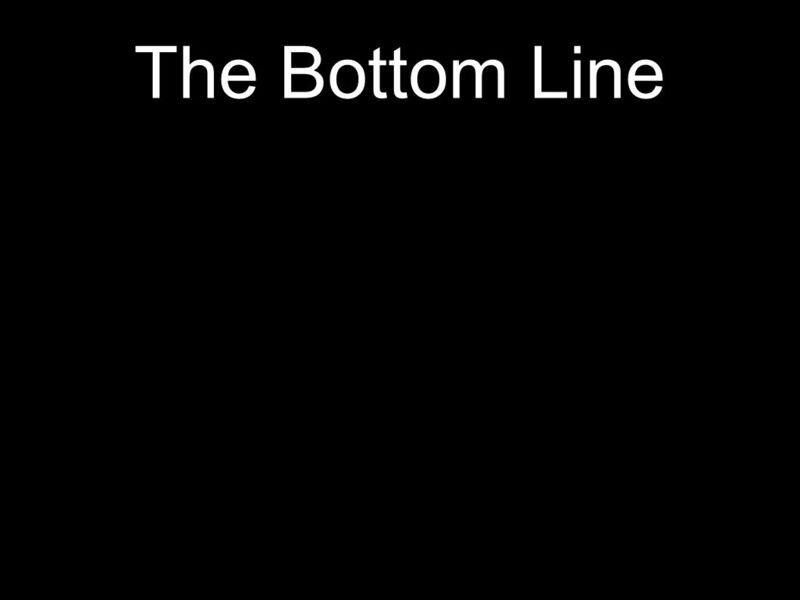 6 lines of text/slide. 6 words/line. 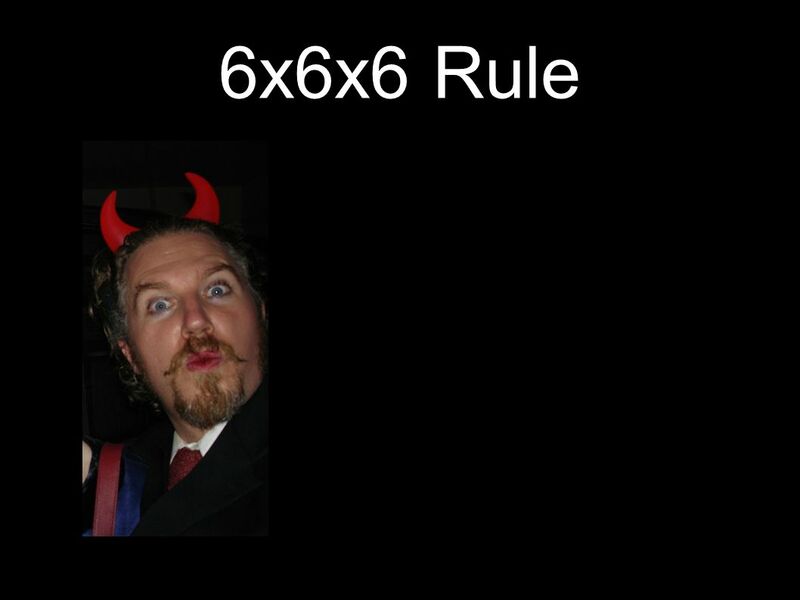 13 6x6x6 Rule Not really evil. 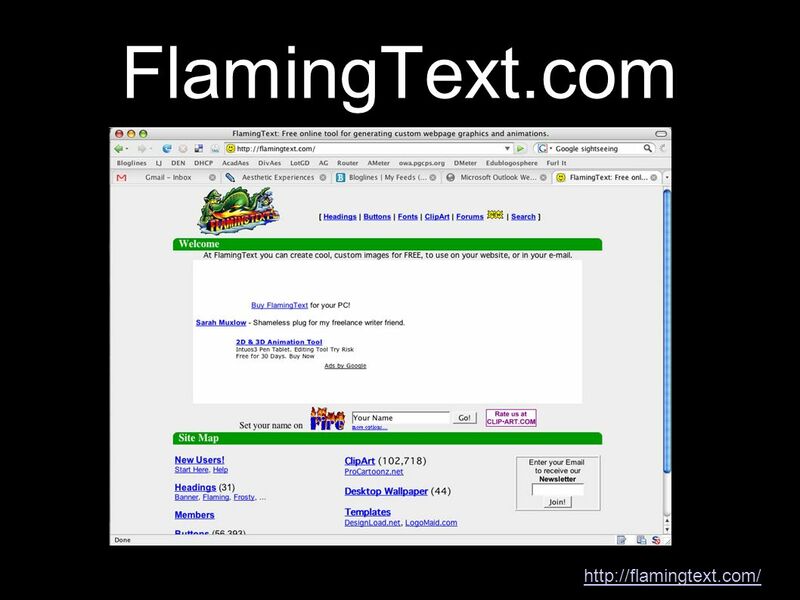 6 lines of text/slide. 6 words/line. 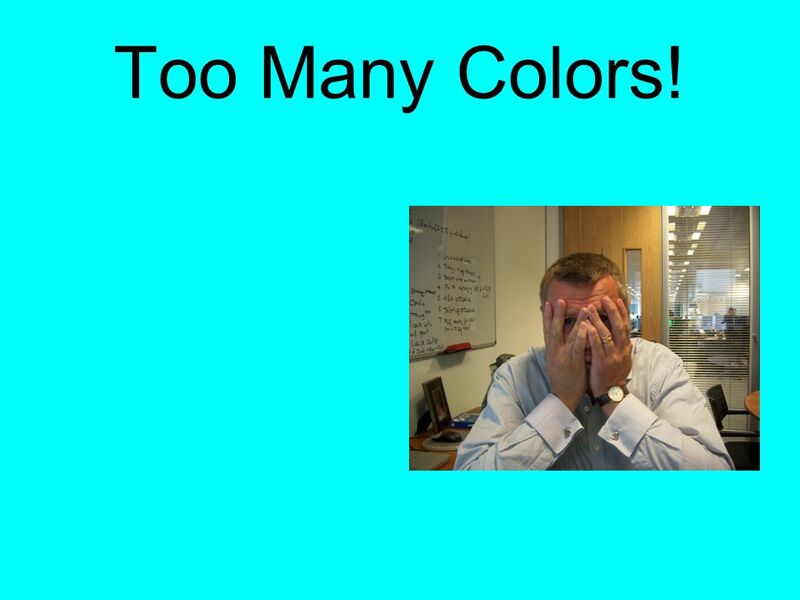 15 Too Many Colors! Can you read this? 16 Too Many Colors! Can you read this? 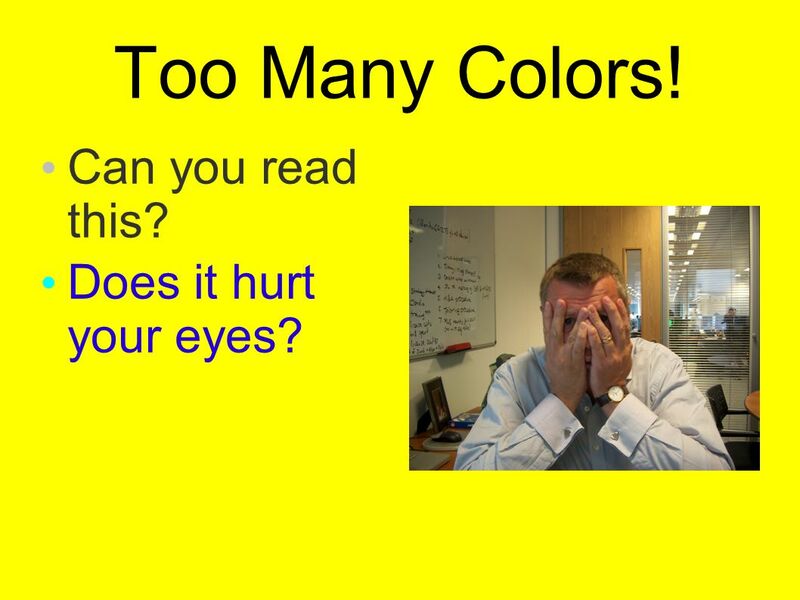 Does it hurt your eyes? 17 Too Many Colors! Can you read this? 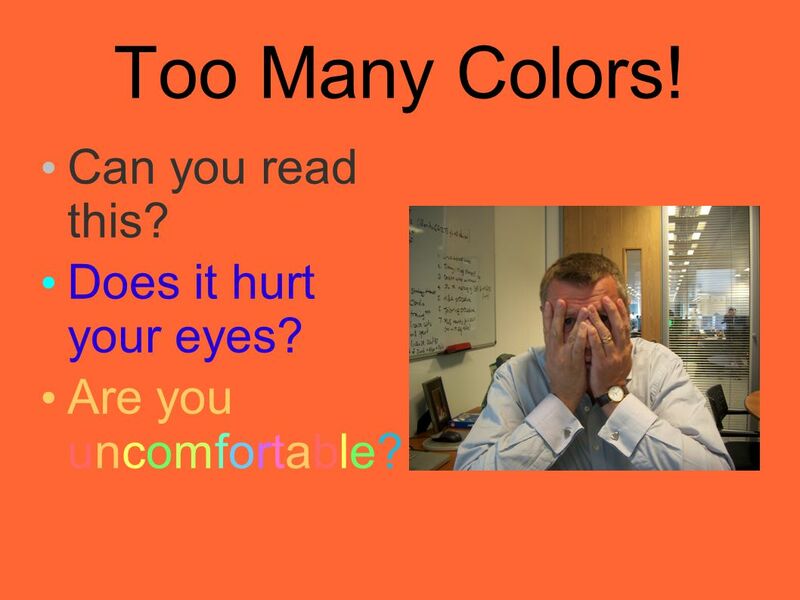 Does it hurt your eyes? 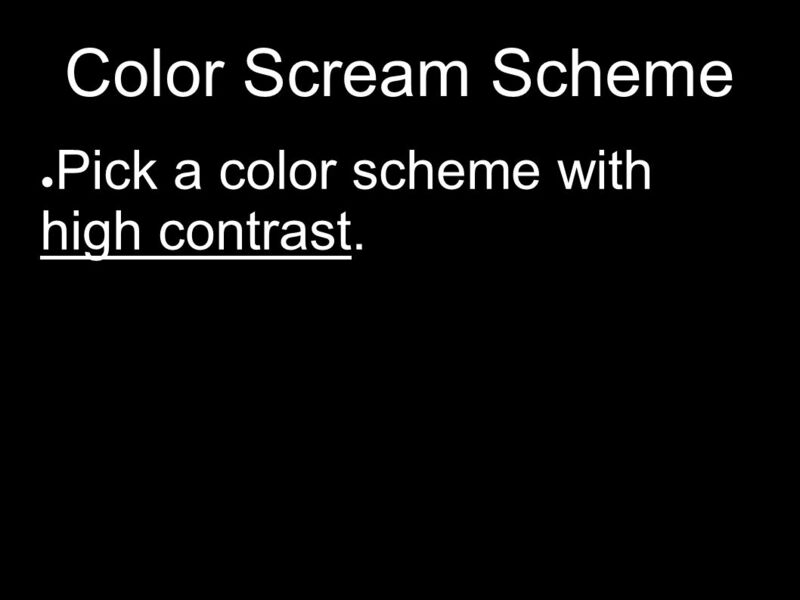 19 Color Scream Scheme Pick a color scheme with high contrast. 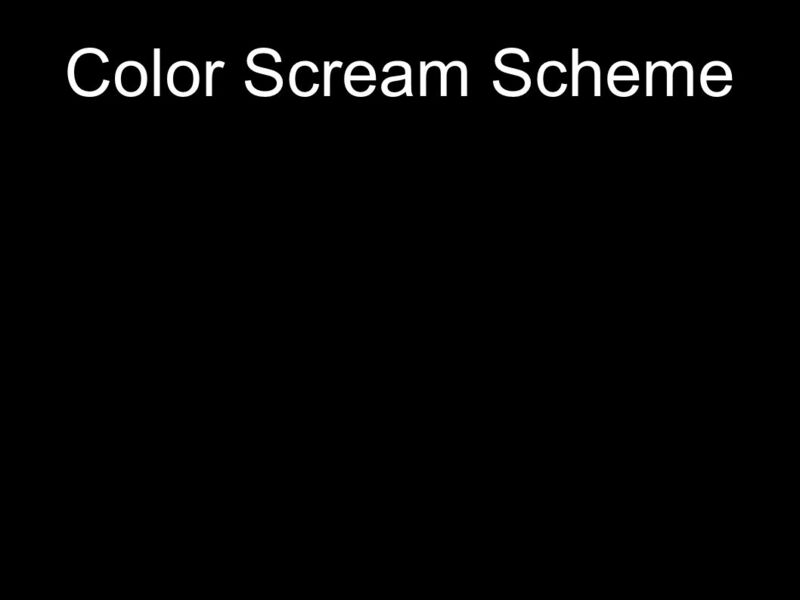 20 Color Scream Scheme Pick a color scheme with high contrast. Keep those colors for the whole thing. 22 Animations & Sounds This is my college roommate. 23 Animations & Sounds This is my college roommate. This is also an in-joke. 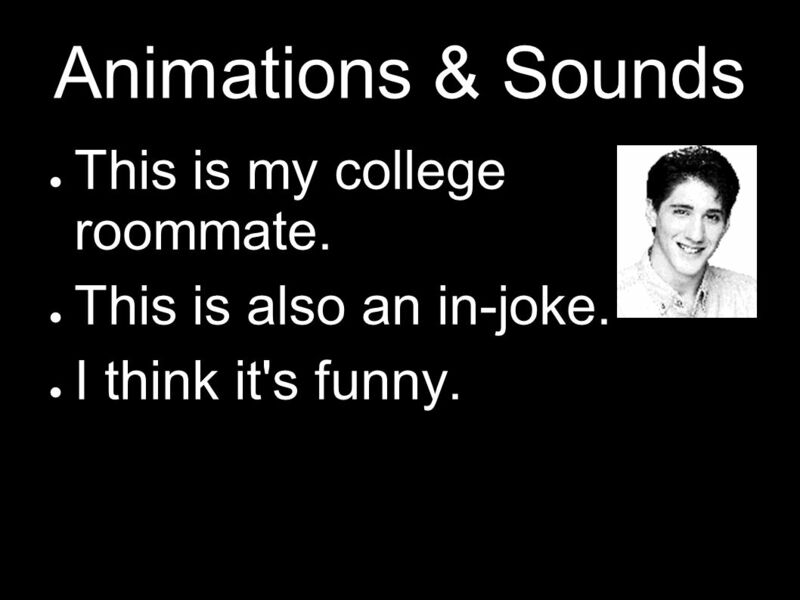 24 Animations & Sounds This is my college roommate. This is also an in-joke. I think it's funny. 25 Animations & Sounds This is my college roommate. This is also an in-joke. I think it's funny. But it shouldn't be here. 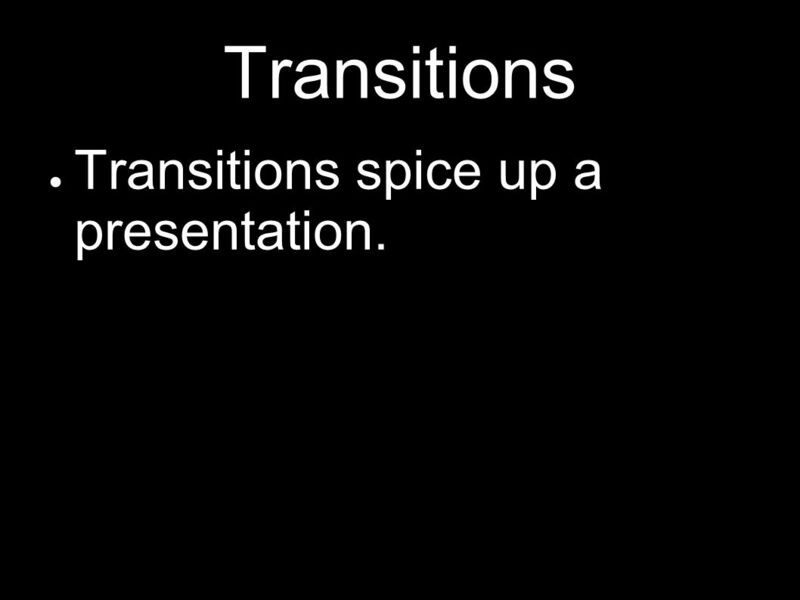 27 Transitions Transitions spice up a presentation. 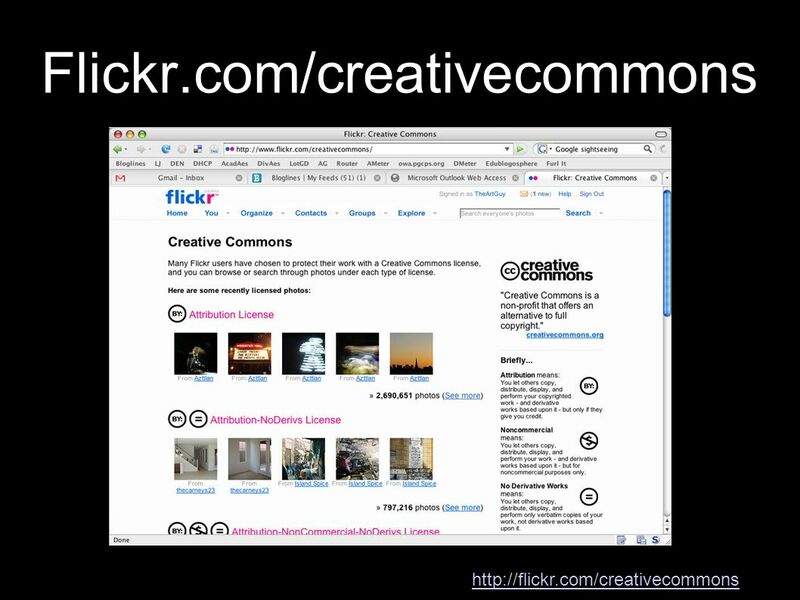 28 Transitions Transitions spice up a presentation. PowerPoint provides a wide variety of them. 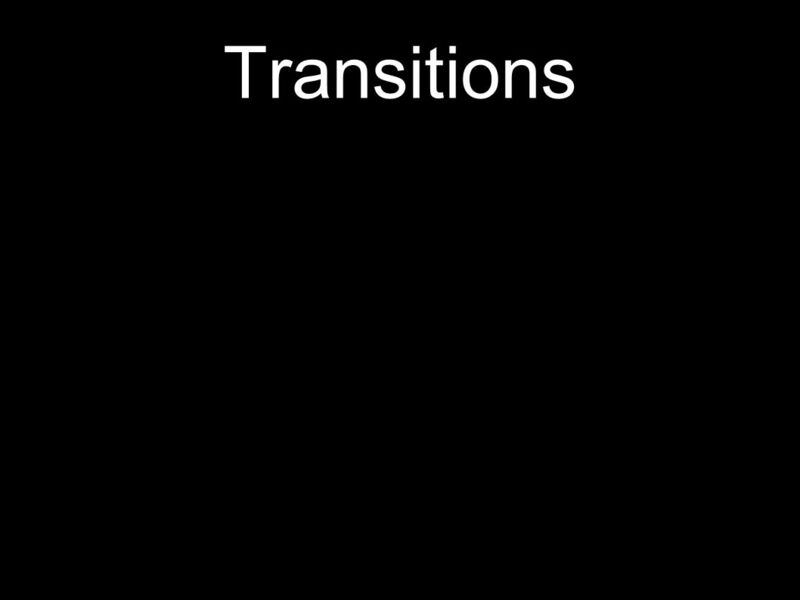 29 Transitions Transitions spice up a presentation. PowerPoint provides a wide variety of them. There's a strong temptation to use all of them. 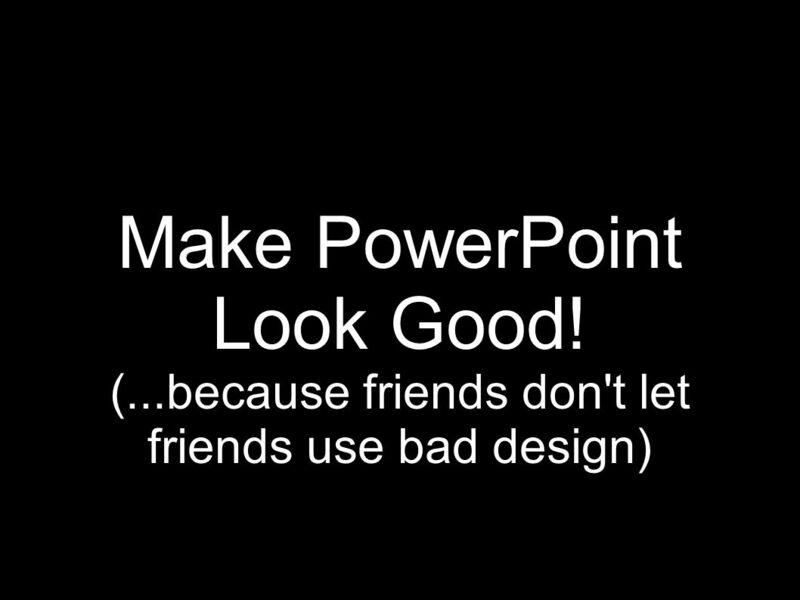 Download ppt "Make PowerPoint Look Good!" PowerPoint Guidelines 2007 WV Envirothon Current Environmental Topic. 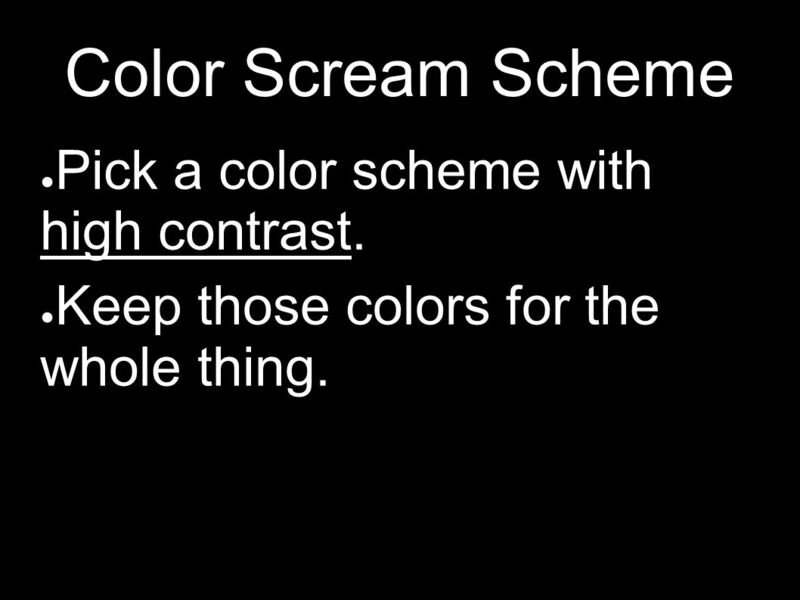 Tips for Killer PowerPoint Presentations Nika Plevnik. Guidelines for Giving a Truly Terrible Talk Guidelines Strict adherence to the following time- tested guidelines will ensure that both you and your work. 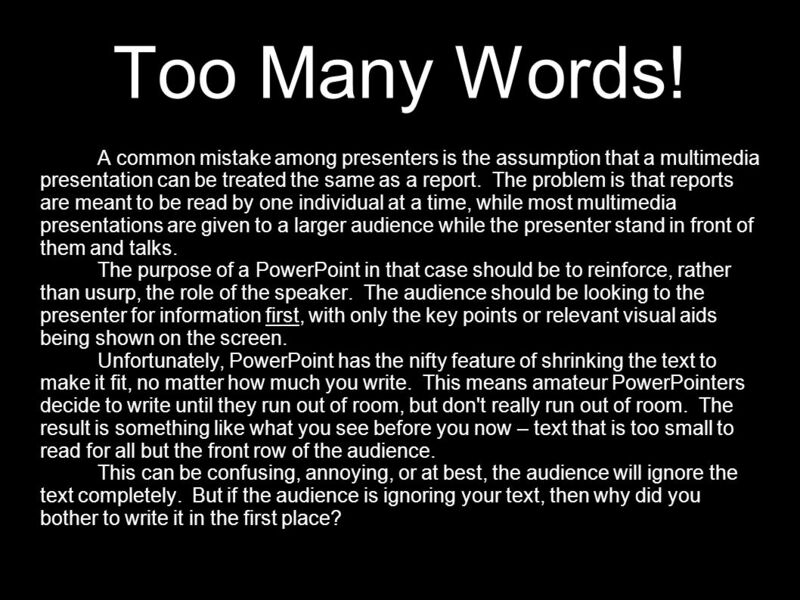 POWER POINTERS 10 TIPS FOR CREATING A POWERPOINT PRESENTATION. Communicating through PowerPoint Megan O’Byrne CLEAR 3 Sept 09. 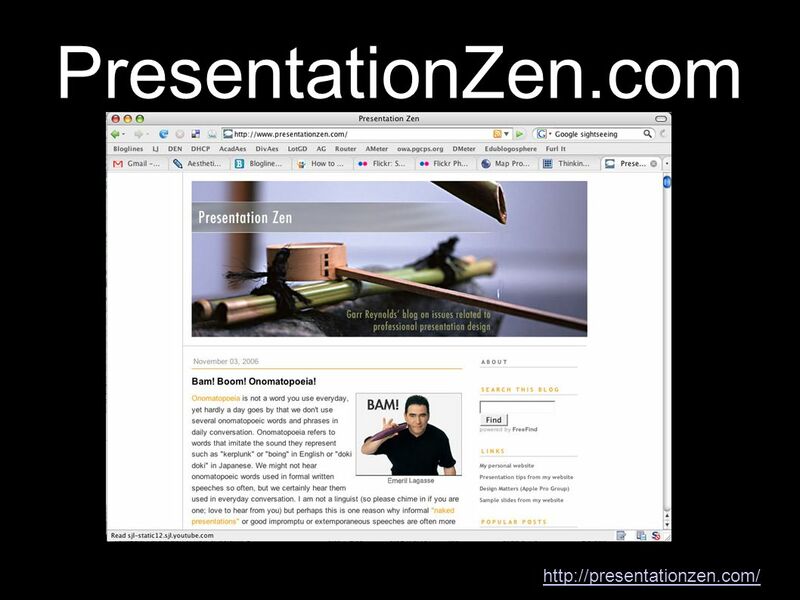 Presentations Tips for Developing A Presentation. How to make a presentation Hy D. Tran, ME260, Spring 2004. Effective Use of PowerPoint The dos and don’ts of Slide Design. 1 Matakuliah: G1062/Public Speaking Tahun: September 2006 Using Visual Aids Pertemuan 11. 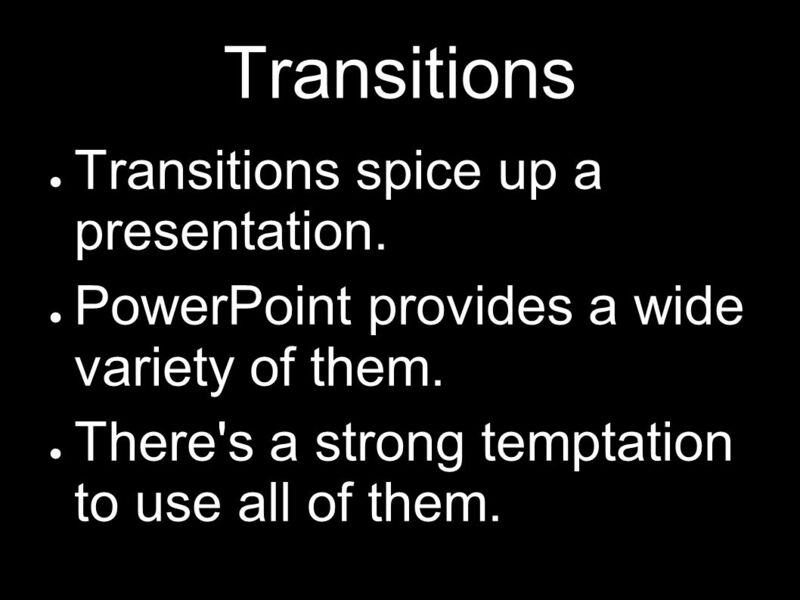 The Good, The Bad, and The Ugly: PowerPoint Basics By: Vicky Knickerbocker and Brent Olsonawski. 1 PowerPoint Presentation Design Wednesday, September 02, 2015Ms. Wear Info Tech 9/10. 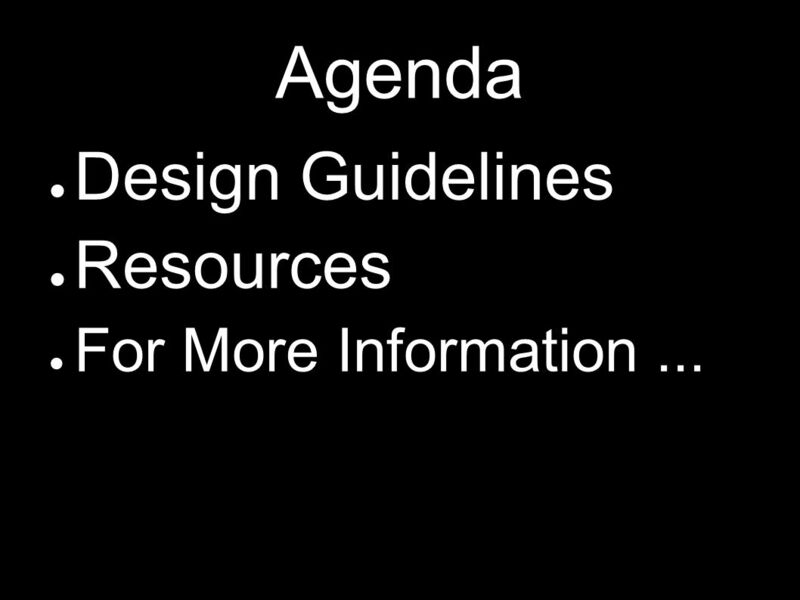 A word about bullets… The do’s and Don’ts when creating bullets on slides. 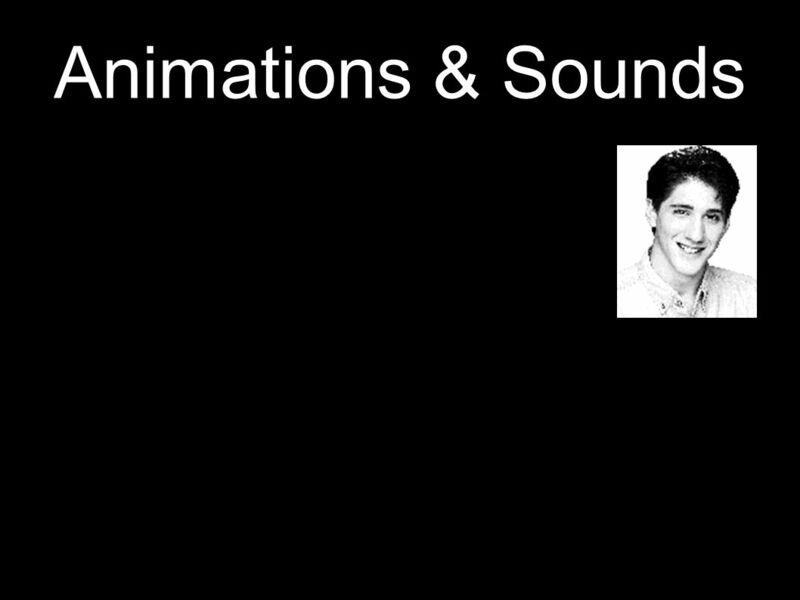 DEVELOPING EFFECTIVE POWERPOINT PRESENTATIONS Effective PowerPoint presentations Excited By Animations, sound and Clip art In PowerPoint? You Are ? 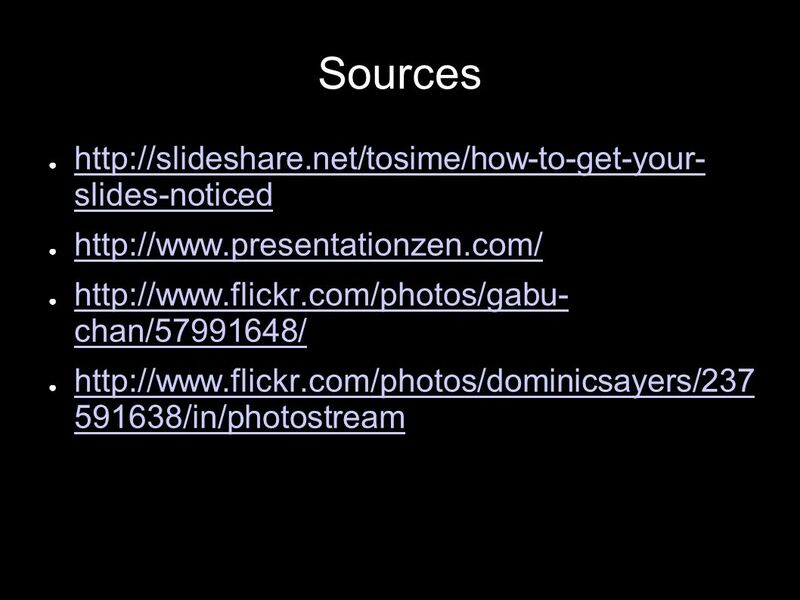 How to Create Effective PowerPoint Presentations David Young.